It’s The End Of The World! Hell Has Frozen Over & Released It’s Flesh Eating Zombies On Denver! The Crawl To End All Crawls Will Happen On Saturday September 13th In Downtown Denver On Larimer St! 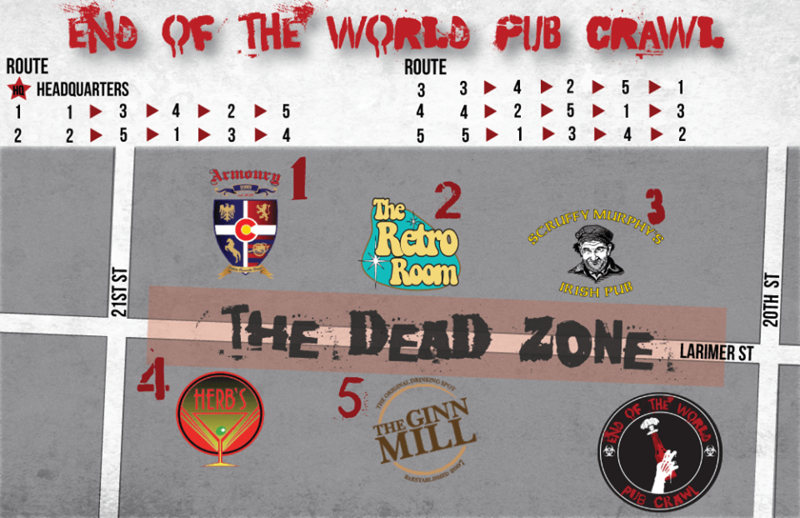 Your Challenge Is To Crawl All Participating Venues While Avoiding The Zombies Trying To Take Your Life (Flags). Do So & You Have A Chance At Winning One Of Several Amazing Prizes. Lose Your Life (Flags) & Still Finish The Crawl & You Will Have A Chance To Win One Of Many Other Prizes. Enter The Dead Zone Today. We Are Happy To Announce A Portion Of The Proceeds Will Be Donated To Hope For Young Adults With Cancer!